Breast Cancer stories at Techdirt. stories filed under: "breast cancer"
Human genetic studies are pointing to more and more interesting information about how our bodies work and develop and ultimately fail. Optimists point to using this knowledge for the improvement of the human condition, but there are some obvious counter-arguments to this viewpoint. So far, though, the technology for genetic therapies or designer babies hasn't been anywhere near perfected, giving us some time to reflect on the possibilities and pitfalls. Unfortunately, our inherent biases in what we're looking at in our genome might prove to be our own undoing. Last year, the Supreme Court made an important ruling in the Myriad Genetics case, effectively saying that genes aren't patentable, even if you can separate them out from the rest of a strand of DNA. Myriad Genetics had isolated two key genes related to breast cancer, BRCA1 and BRCA2 and argued that only it could test for those genes, because of its patent. The Supreme Court soundly rejected that, noting that you cannot patent something in nature, and clearly Myriad did not "make" the genes. Unfortunately, as we'd noted just a few months earlier, a court in Australia had come to the opposite conclusion, saying that Myriad Genetics had legitimate patents on BRCA1 and BRCA2. That case was appealed, and there was some hope that after the US's ruling, higher courts in Australia might see the light. Not yet apparently. An appeals court has agreed that genes are patentable Down Under, which means that such important genetic tests there are likely to be much more expensive and limited. You can read the full ruling here if you'd like. The case can still be appealed to the Australian High Court, so perhaps it will take the same trajectory as in the US, where it needed the Supreme Court to finally point out the absolute insanity of patenting genes. Though, frankly, if Australia does keeps genes patentable, it might make for an interesting natural experiment to see how much innovation and research happens in both places -- one with, and one without, patents. Remember how, just a month ago, the Supreme Court had struck down gene patents in the Myriad case? If you don't recall, Myriad claimed, effectively, to have patented the isolated BRCA1 and BRCA2 genes, which are indicators of a likelihood for developing breast cancer. As such, they blocked anyone else from doing tests to find those two genes, and charged a whopping $4,000 or so for anyone who wanted the test. The Supreme Court, thankfully, tossed out those claims, noting that Myriad "did not create or alter any of the genetic information" in those genes, and that if found valid, it would "give it the exclusive right to isolate an individual’s BRCA1 and BRCA2 genes." That's obviously crazy, so it was good that the Supreme Court rejected those claims. As of the morning of June 13, 2013, Plaintiffs collectively had 24 patents containing 520 claims concerning two genes (BRCA1 and BRCA2), and methods of use and synthetic compositions of matter related thereto. On June 13, the Supreme Court of the United States ruled that five patent claims covering isolated naturally occurring DNA were not patent-eligible, thereby reducing the overall patent estate to 24 patents and 515 patent claims. This case involves none of those five rejected claims. The patent claims the Supreme Court invalidated last month were “composition of matter” claims, covering the chemical structure of the BRCA genes. But Myriad’s patents also have “method” claims covering processes for diagnosing breast cancer. And while these patents use different language than the composition-of-matter patents the high court invalidated, their practical effect on the genetic testing market could be very similar. Consider Patent 6,951,721, one of the patents cited by Myriad in its lawsuit against competitor Ambry Genetics. It claims the concept of diagnosing breast cancer by “determining the nucleotide sequence of the BRCA1 gene” from a “female individual” and then checking for mutations at specific points on the gene. The patent isn’t limited to any particular technology for isolating or sequencing the patient’s BRCA1 gene. So while it’s not technically a patent on the BRCA1 gene, it might as well be. Of course, as you look over the details, it seems like Myriad is still going to be in trouble. Effectively, the claims it's relying on may appear to be more similar to a patent on the diagnostic process itself. But, that's a problem for Myriad, because in the big Prometheus Labs case, which the Supreme Court decided a year ago, and which it relied on in the Myriad case itself, medical diagnostics aren't patentable either. PubPat director Dan Ravicher, e-mailing Ars from Beijing, described Myriad's new suits as a way to save face with Wall Street. He said the Supreme Court decision was a "total loss" for Myriad, and the synthetic cDNA they are focused on now is not needed for genetic testing. "I am confident they will lose these cases, too, so long as the defendants have the financial resources and institutional desire to fight," said Ravicher. Of course, it's that last bit that's the challenge. Any such case will take years and millions of dollars. And, during that time some may just choose to settle, and if lower courts side with Myriad and issue injunctions it can be a big risk for the competitors in the space. The end result may work in Myriad's favor even if these cases are completely bogus: it's likely to scare away competitors, and keep the prices of its breast cancer gene tests very high, making it much more likely people will die. I do wonder how Myriad's execs look at themselves in the mirror. There is no reason for doing what they're doing other than to enrich themselves, while ensuring that more women will die from undetected breast cancer. Sickening. While the FTC has claimed that it's going to go after patent trolls, this seems like another situation where they, along with the DOJ, should also look into Myriad. While it may not be a traditional "troll," there's certainly a strong argument to be made that the company is abusing patents in a manner this is likely to lead to much higher prices for consumers, especially following the Supreme Court rejecting the very premise that they're now relying on in these new lawsuits -- that no one but Myriad can offer tests for BRCA1 and BRCA2. One hopes that the FTC decides to expand its "investigations" into companies like Myriad. 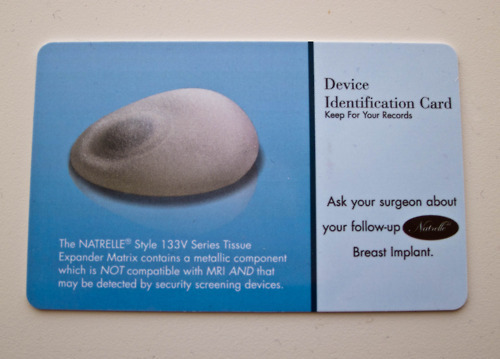 I told her that I was not comfortable with having my breasts touched and that I had a card in my wallet that explains the type of expanders, serial numbers and my doctor�s information (pictured) and asked to retrieve it. This request was denied. Instead, she called over a female supervisor who told me the exam had to take place. I was again told that I could not retrieve the card and needed to submit to a physical exam in order to be cleared. She then said, �And if we don�t clear you, you don�t fly� loud enough for other passengers to hear. And they did. And they stared at the bald woman being yelled at by a TSA Supervisor. To my further dismay, my belongings, including my computer, were completely out of sight. I had no choice but to allow an agent to touch my breasts in front of other passengers. We strive to treat every passenger with dignity and respect. In this case, that may not have happened. During the screening process, if advanced imaging technology detects an anomaly that cannot be cleared, secondary screening is required to ensure the passenger does not have threat items, such as explosives concealed under clothing. All passengers may request private secondary screening. While an initial review indicates that proper screening procedures were followed, we regret that this passenger did not have a positive experience. Which, of course, brings to mind a simple question: does anyone actually have a positive experience dealing with the TSA patdowns?